I recently took up playing the ukelele; I’ve always wanted to play a string instrument, but the guitar was just too obvious – everyone plays the guitar! I wanted a different sound, and something relatively easy to play, and the ukelele was the ticket. However, when not practicing, I had no real good place to put it down; a table top took up too much room, and just leaning it into a corner was too iffy. The commercial stands sold are very ugly and metallic; functional, yes, pretty, like my ukelele, no. So, I created this mahogany stand for it (after several prototypes). It hangs the ukelele (or your mandolin) in a bendable, yet solid foam covered cradle, so the instrument is not having it’s bottom or side roughed up, had it been laying down – and it’s very easy to shape the cradle arms in or out to suit your instrument’s needs. 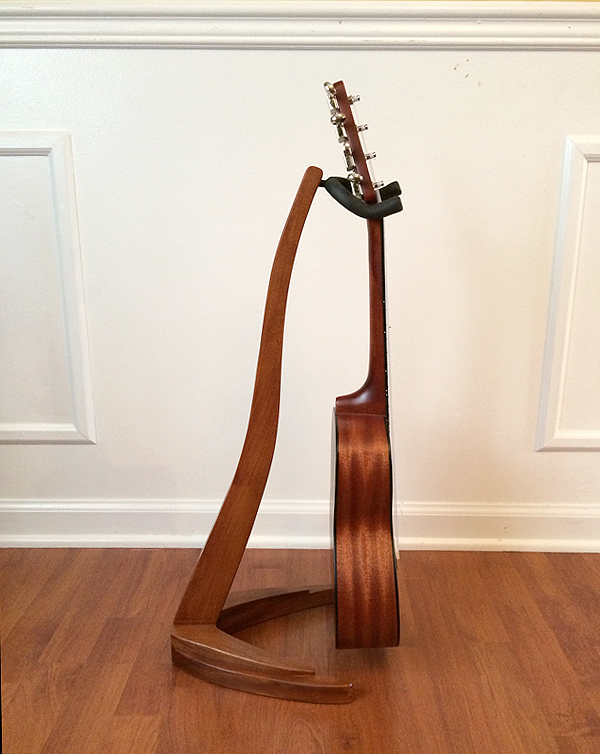 My ukelele’s head is asymmetrical, so adding a slight twist to the cradle when installing it was right for me – we can discuss your instrument’s needs upon ordering. 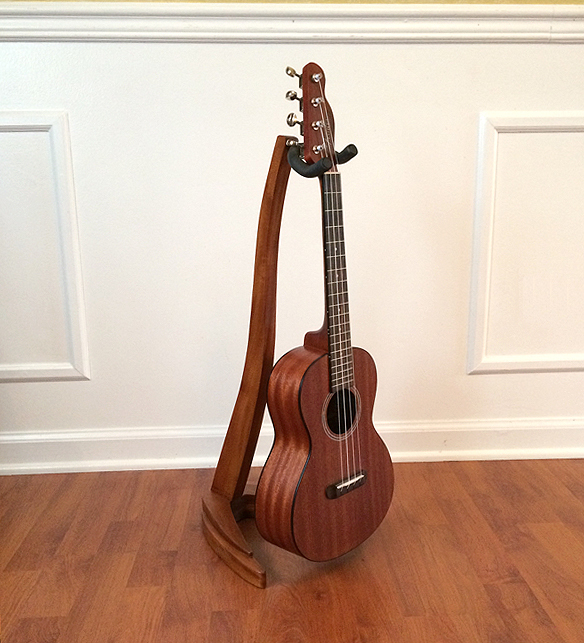 Perhaps just as important as a great way to set your instrument, this piece just looks great – a fine complement to your beautiful ukelele or mandolin – unlike some cheap ugly metal stand. This piece would look great in your living room, office – or wherever you practice. While this piece is in mahogany, obviously other wood choices are available, and can be combined. I could see this piece in cherry, with the top of the two “boomerangs” on the base being ebonized, or blackened, for contrast. Or, if you are the more adventurous type, we could try Zebra wood, or Purpleheart, or Yellowheart. Possibly, I could match your instrument’s woods as well.